Disclaimer, I’ve never owned an iPhone so I’m not particularly qualified to comment on the new version announced at WWDC yesterday. But like everyone else I’m caught up in the hype and wanted to record my impressions. High speed UMTS/HSDPA 3G on 2100, 1900 and 850 mHz plus quad-band GPRS/Edge making it compatible with most, but not quite all non-CDMA networks. Not supported are the 1700 mHz 3G that T-Mobile USA is starting to rollout and 900 mHz UMTS, which is gaining ground in Europe and Asia. Installable applications available only from the Apple Application store. Some are free, others cost an average of $10. Developers and Apple split the revenue 70/30. 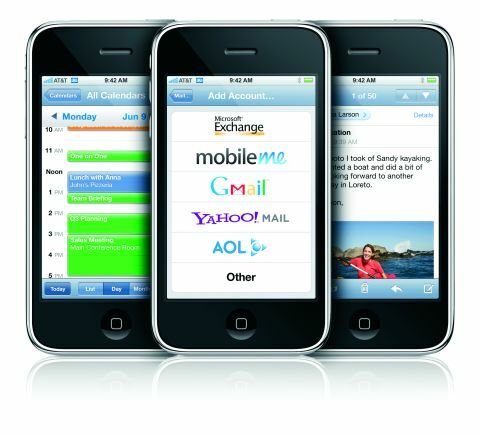 Calendar and contact synchronization, media sharing and push email using an optional $99/year web based service called Mobile.Me. The end to the iPhone’s unique pricing and activation models. iPhones will be subsidized and only sold by carriers. Apple will no longer receive a share of voice and data revenues from carriers. A price “reduction” to $199 for the 8GB model. Carriers are apparently free to raise the cost of plans and ATT has already announced a $10/month increase to theirs. In addition ATT iPhone plans will no longer include 200 text messages unless you pay another $5/month. Of course, the iPhone’s best features are retained. The incredibly slick, immediately grokable UI and beautiful industrial design that have been hallmarks of Apple products since the the first Mac are there along with an unsurpassed mobile browsing experience. I don’t know were Jobs finds them but he’s got a team of design geniuses. Apple is so far ahead in user experience that there is really no competition at the moment. iPhone lookalikes are starting to appear, I’ve tried two of the first, the LG Voyager and the Samsung Glyde and they don’t come close to the real thing. Both phones superficially look like iPhones but are marred by clumsy interfaces that are inconsistent across different applications and touch screens that seem bulky and unresponsive compared to the iPhone. 3G, the end of revenue sharing and the price “cuts” should help to sell a lot more iPhones. 3G and AGPRS are essential features for an advanced mobile handset today. Their lack cost Apple a lot of sales particularly among sophisticated mobile users. Carriers hated the idea of sharing revenue with Apple. Even though ATT made money under the deal, I think many carriers refused to accept Apple’s terms as something that would set a dangerous precedent. With revenue sharing dead, carriers are falling all over themselves to pick up the iPhone. ATT’s new plan prices actually increase the total cost over the life of a two year contract, but the sad fact is that most of us live paycheck to paycheck and a $199 ticket is a lot easier to swallow than a $399 one. What about the rest of the handset industry? I think Nokia, Symbian, Microsoft, HTC, SE, Samsung and LG must be in full battle mode. Apple is a threat to both market share and prestige for them, they must counter the iPhone. The Korean manufactures seem to have a shorter design cycle, it took them less than a year to bring to market phones that copy the iPhone look if not the feel. Nokia, RIM and Samsung have announced touch screen smartphones for later this year that, at least on paper, seem to be more worthy competitors. Self destructing Motorola hasn’t even shown a prototype yet. It’s relatively easy to copy the iPhone look and feature set, but creating a better user experience than Apple is nearly impossible. It may not be necessary. After 13 years of development, Windows is still generally perceived as having inferior usability to the Mac. But Windows outsells Mac by 12 to 1. Why? Much bigger software library, more hardware options and lower costs. The iPhone is a single handset on a closed platform, with arbitrary restrictions on developers and proprietary synchronization and software distribution models. I think the way to beat Apple is with an open, expandable mobile OS with low barriers of entry to both hardware manufacturers and software developers – where anyone can create and distribute compatable devices, software and services. This is the Android model but it’s also close to the Windows Mobile and Symbian approach of licensing the OS to multiple vendors. More software and device choices make for a more powerful phone that meets the needs of more users. As Windows vs Mac shows, power and choice can beat a slick design and user experience. Interesting comparison with Windows vs Mac. You could be right. However, people forgive Windows because, although it’s not the best, it’s still very usable. In mobile, the limited screen and input make things much less usable and people may be more inclined to pay a premium price for the ‘best’ user experience. Contradicting what I have just said, I think people are lowering their expectations of electrical goods usability. Just look at DVDs, set top boxes etc. The current cheap products from China aren’t as usable as early European products and often lock up/malfunction.